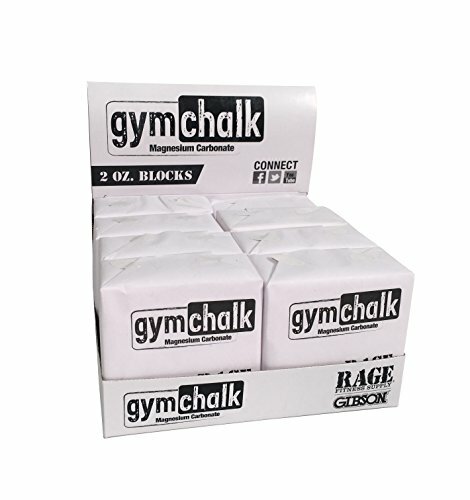 RAGE Fitness Block Chalk is preferred by athletes around the globe due to its superior hold. One pound includes (8) 2 oz. blocks. Gymnasts and athletes alike will benefit from the superior grip that the RAGE Fitness 1 lb. Chalk Block offers for Olympic lifts and gymnastics movements. Choose from various sizes to find the optimal amount of force. WARRANTY INFO: RAGE FITNESS EQUIPMENT (WITH THE EXCEPTION OF GRIPS) IS GUARANTEED FOR A PERIOD OF ONE YEAR FROM DATE OF INVOICE AGAINST FAULTY MANUFACTURING OR DEFECTS IN MATERIAL. RAGE Fitness is built on sweat, passion, sacrifice and some of the strongest, most durable functional fitness equipment on the planet. RAGE (r j) is all about explosive force, furious intensity and burning desire, and the products we offer prove it every day. We fuel the passion and intensity (a.k.a. the RAGE) for people who lift, jump, push, kick, run, climb, catch, twist, flip, resist, sweat and recover, and then do it all over again to push their athletic limits, reach their goals and improve their lives. The brand was born in 2008, but it didn't take long for RAGE to spread to gyms, boxes, garages and fitness clubs across the country and around the world. RAGE erupted into retail in 2012 and since then has become the definitive, authentic and accessible functional fitness brand in sporting goods and fitness specialty. Warranty: WARRANTY INFO: RAGE FITNESS EQUIPMENT (WITH THE EXCEPTION OF GRIPS) IS GUARANTEED FOR A PERIOD OF ONE YEAR FROM DATE OF INVOICE AGAINST FAULTY MANUFACTURING OR DEFECTS IN MATERIAL. Soft leather grips with velcro closure. Available in red, white, black, blue, pink and purple. Sold as a pair! Whether you do strict pullups or kipping pull ups, can do 10 unbroken muscle ups or are working on your first, can do 100 kettle bell swings in a row or just a few... whatever type of athlete you are... none of us like to deal with blisters, callouses, or ripped palms! For those of you that leave it all in the gym, let us help you take care of your hands. We designed these leather hand grip protectors with you in mind. Not only that but we decided that just because these were strictly palm protection doesn't mean they can't be cool so we made them in 5 snazzy colors and 3 sizes (fits both men and women) to fit any athlete from pro CrossFit stars to gym newbies and everyone in between. PREMIUM LEATHER AND NYLON WRIST STRAPS - Unlike other brands, we use top quality leather that is not only durable but also soft and form fitting. We triple stitch that to a bulletproof nylon wrist strap that holds everything in place but doesn't irritate your wrist. 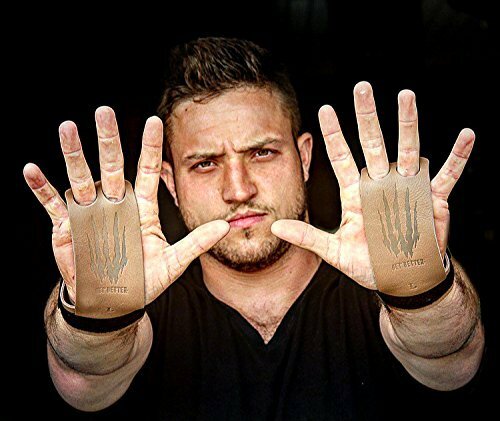 THE BEST LEATHER PALM GRIPS AVAILABLE - Designed from the ground up for sports like weightlifting and gymnastics. If your sport includes a barbell, gymnastics ring, kettlebell, or pull up bar then don't settle for cheap imitations that either don't work or wear out fast. Get the best! Also serves as a great alternative cure for sweaty hands in other sports: tennis, golf, baseball, etc. Whatever type of athlete you are... None of us like to deal with blisters, callouses, or ripped palms! For those of you that leave it all in the gym, let us help you take care of your hands. We designed these leather hand grip protectors with you in mind. When working with bars or other Crossfit equipment, a thicker material is preferable: it isn't going to shift around on your palm and tear easily with repeated use. You'll also notice that our finger holes are round and not square. While square holes are easier and cheaper to punch, the round holes snuggly fit the shape of your fingers. Our wrist straps are made of a combination of powerful leather and woven material to ensure a comfortable protection. -Strong Grip:New palm design with extra leather guides you into finding the best contact points and minimize grip loss. 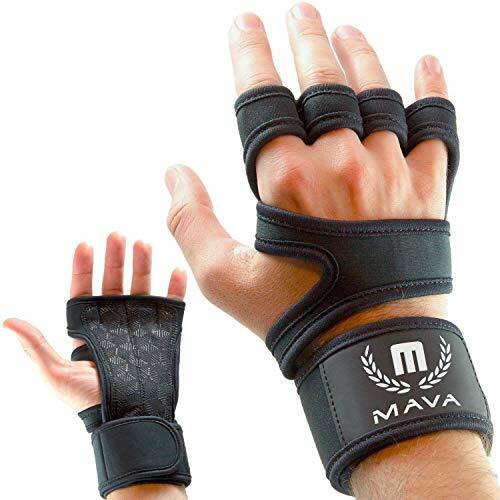 -Wrist Support:Oversized wrist wrap supplies maximum stability giving you confidence for that last rep.
-Hand Protection:Thoughtfully made palm design prevents calluses and blisters, allowing you to not postpone anymore workouts. REMENBER:We also have our 100% liftime guarntee,If for any reason you're not 100% satisfied, we will REFUND your payment or send you a new one... no questions asked! PREMIUM LEATHER HAND GRIPS-We use high quality leather that is not only durable deodorant but also soft and form fitting.It provide wrist support and stability, and protect you against injury callus and tears. SAFE WRIST SUPPORT: More than just perfectly covering your palms, these hand grips safely encircle your wrists and can be conveniently adjusted according to your comfort level. 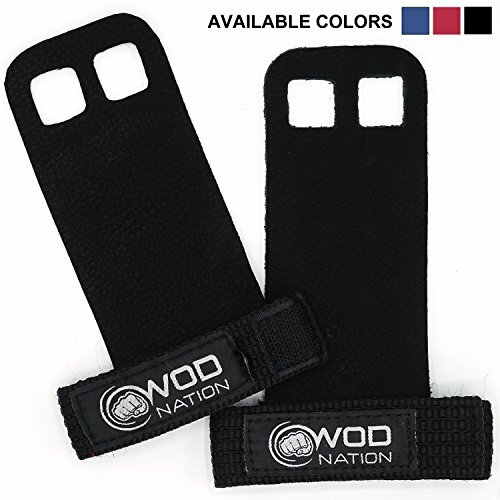 Ergonomically designed to minimize pressure, reduce wrist strain and remain steady throughout your WOD or exercise routine, these grips are a powerful shield against a host of long-term wrist and joint conditions. 100% SATISFACTION GUARANTEED:If for any reason you're not 100% satisfied, we will REFUND your payment or send you a pair of new replacements... Please don't hesitate to contact us,we will always be here if you need us. It doesn't take long to realize that ripped hands or palms drastically impact your life. From not being able to write your name with an ink pen to that blood curdling sting the first time you hop in the shower, we all know that sting... We at Bear KompleX have been down this road more times than we can count and we finally had enough. With the help of many of our friends and local boxes we have developed the best crossfit gloves to help you dominate your WOD and actually enjoy that post workout shower. From using the highest quality leather that will form to the bar shape over time, to the most comfortable wrist strap that keeps the buckle from digging into your wrist, we think we have nailed it. We currently have options available including multiple sizes, 2 colors choices, and also a 2 OR 3 hole grip selection to customize your experience. With Cross Training and daily work in your respective box, everyone is there to improve and push the ones around them. This is why you will see the Bear KompleX motto of "GET BETTER" on every pair of grips to give you that push you need. The next time you look down at your hands in the middle of "Angie" or "Fran" we want you to get some inspiration to get back up on that bar and "GET BETTER"! Click above and get a pair of gymnastics crossfit grips today!!! You won't be disappointed... Our Black grips are a bit thinner and made of a suede material while our tan and grey grips are natural leather and break in like a baseball glove. Try one or try both!!!  THE BEST HAND GRIPS ON THE PLANET! Bear KompleX genuine leather Hand Grips are the perfect gloves for you to knock out your workout. You have a 2-Hole & 3-Hole option to protect your palms. The Grips are breathable and designed with an adjustable wrist strap for optimal comfort and support. Choose a color option that matches your style. DURABLE QUADRUPLE STITCHING will ensure full support and stability when using the Bear KompleX gymnastics grips. Enjoy the stronger & longer hold on the bar! These gloves will NOT dig into your wrist or open up during use. You shouldn't have to worry about your hands when dominating your WOD! 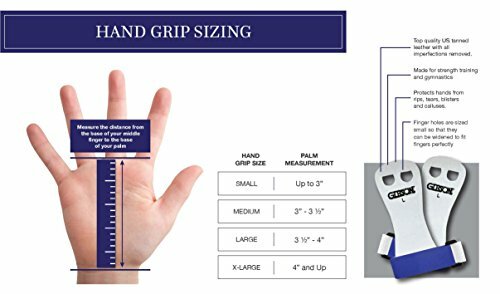  DOMINATE EFFECTIVELY: To ensure you get the best out of your Hand Grips, make sure to measure your hands following the instructions in the image block. We are so confident you will love our Bear KompleX products, that if your expectations are not met for any reason, we will refund you within 60-days of purchase. 螺 FREE Carabiner grip clip included to make sure your pair of Grips never gets lost! AND BONUS Road Workout PDF to keep your fitness game on top while on the go. Be sure to look at the special offer section below check for discounts on ALL Bear KompleX products. 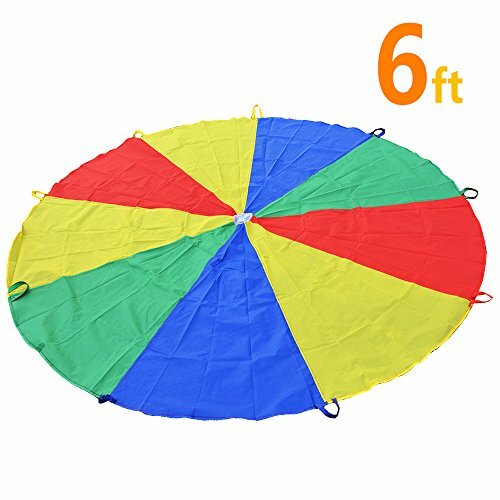 The 6 feet Game Parachute is perfect for birthday parties, picnics, community events and more. Simply un-fold the parachute from the provided carry-bag and let the fun begin. Sturdy handles along the edges allow children to easily grip the edge. 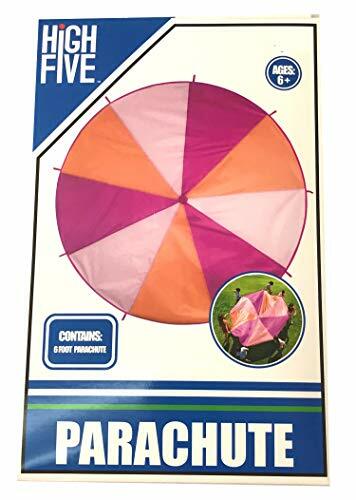 There are many games you can play with a parachute. A few are:Popcorn - place small balls in the parachute and shake to make them jump around like popcorn. Making Waves - make small, medium or large waves across the parachute. Merry-Go-Round - Hold one handle and walk in a circle. Switch - Call out a birthday month, age or a pre-assigned color and have children swap places under the parachute before it falls. And Many More. A parachute can also make a great fort by draping it over furniture, use it as a large picnic blanket, make it home base for tag or hide under it-no more ruining your sheets for your children s play fort. durable 210T polyester taffeta fabric with reinforced web handles, simply machine wash under delicate with mild soap and air dry at the end of the day to get it clean again and ready for the next day. 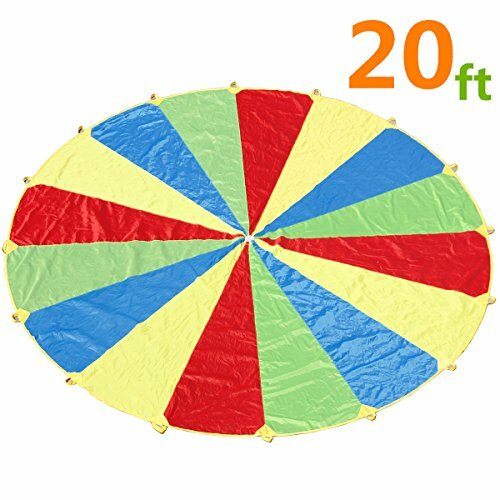 The 20 feet Game Parachute is perfect for birthday parties, picnics, community events and more. Made of flame-retardant 70 denier polyester, simply machine wash under delicate with mild soap and air dry at the end of the day to get it clean again and ready for the next day. 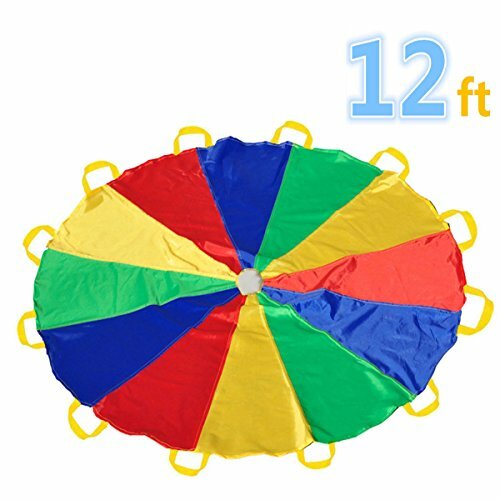 The 12 feet Game Parachute is perfect for birthday parties, picnics, community events and more. From PLAY10, America's registered Brand. Our team began traveling around the world at early 2016, and searched different design inspirations for creating pattern what kids favorite. Providing safe and funny toys to kids is our purpose. Children play parachute creats a play space with sense security and stimulate creativity for 4-10 years kids. 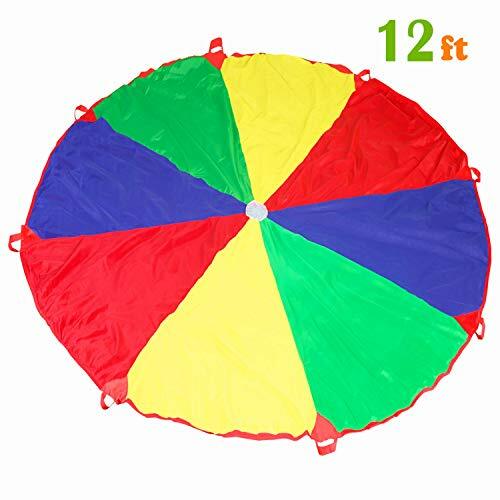 parachute mat for kids play crucial roles in upper limb muscle exercise and the development of team spirit. At PLAY10, we believe in our products. We Provide friendly and easy-to-reach support. What's in the Box? If you're looking to get a better grip at the gym or while climbing, we've got what you're searching for. Refillable chalk ball is a no mess, easy solution to dramatically increase friction on the palms of your hands, shoes, or wherever you need slips stopped dead in their tracks. Easy to refill with the drawstring top, and easy to store with its resealable zip top bag. 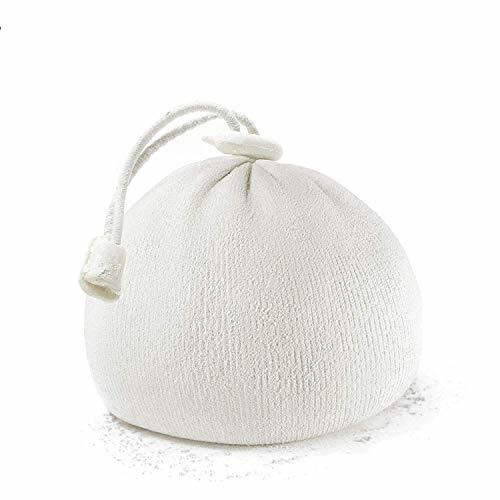 Multipurpose: Chalk balls are suitable for rock climbing, sports, fitness, uneven bars, weight lifting, pole dancing, basketball, badminton, shot put, javelin.. The Chalk Ball has been intensively tested and assessed by Elite Athletics and approved for high performance and durability. We're so sure you'll love it that we offer a 100% no-questions-asked replacement or refund warranty. 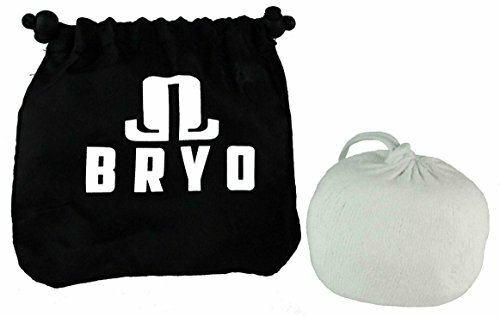 Try it today, risk-free, and experience lifting heavier for longer with the best Refillable Chalk Bag on the market! 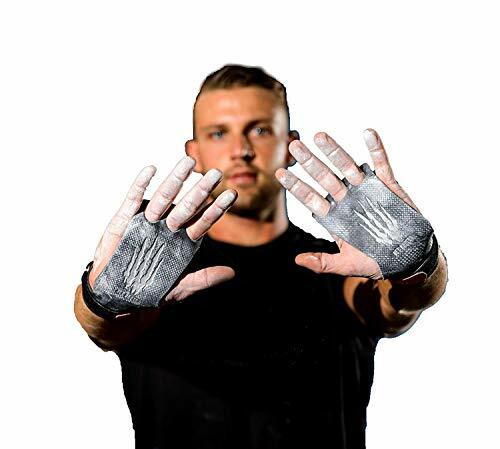 Bear KompleX 3 & 2 Hole Carbon Hand Grips for Gymnastics & Crossfit, Pull-ups, Weight Lifting. WODs w, Wrist Straps. Comfort & Support-Hand Protection from Rips & Blisters.  THE BEST HAND GRIPS ON THE PLANET! Bear KompleX genuine Carbon Hand Grips are the perfect gloves for you to knock out your workout. You have a 2-Hole & 3-Hole option to protect your palms. The Grips are breathable and manufactured from lightweight and sticky carbon fiber with an adjustable wrist strap for optimal comfort and support. Choose a color option that matches your style. 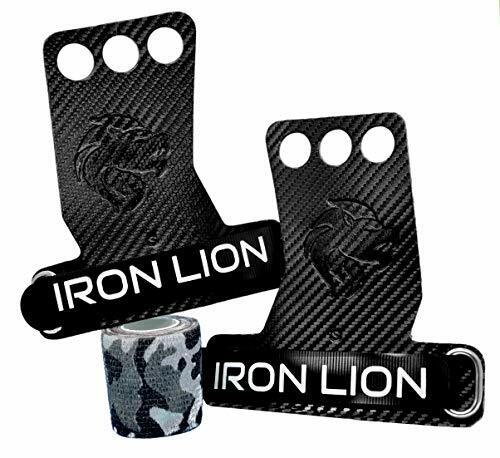 Iron Lion 3-Hole Carbon Fiber Hand Grips for Cross Training, Weight Lifting, Chin ups, Pull ups, Muscle Ups, Toes to Bar, Gymnastics, Kettlebells, Rings, and More - with Bonus Grip Tape! Iron Lion grips are the newest version of premier 3-hole carbon fiber hand grips. 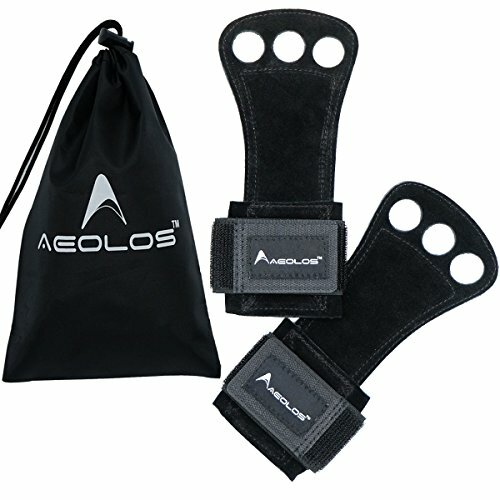 Carbon fiber is the most recent improvement over leather-based hand grips, more effectively protecting your hands from blisters and tearing calluses during pull ups, chin ups, toes-to-bar, chest-to-bar, gymnastics, Crossfit, Les Mils, snatches, deadlifts, powerlifting, cleans, kettlebells, rope pulling and anything else your WOD throws at you! The best athletes know they need to protect their hands as best they can, and we want to help you do the same! Have you had to decide between Rx'ing and keeping your hands intact? With the newly designed Iron Lion grips, you will never have to make that choice again. These grips were designed by a regular Crossfitter based on the good and bad of other products available (and we've tried a lot of products!). We wanted to make a product that solved my callus tearing problem, and now we want to share it with the world! The carbon fiber can be slightly slick until it's broken in, using some chalk on the grip early on will help mitigate that while the gloves wear in and form to your hand. ONE ROLL OF GRIP TAPE IS INCLUDED FOR FREE!! NEW DESIGN PROVIDES MORE FRICTION! Carbon fiber will make it easier for you to tightly grasp a slippery bar or rope! NEW CUSTOM CARBON FIBER CONSTRUCTION! Carbon fiber is stronger, sturdier, and more durable than leather! These grips will also wear in and form to your hands after only a few workouts! ENHANCED WRIST STRAP! Designed for comfort and grip strength, you'll get the support you need to Rx your WODs!